Natsume Takashi is the main protagonist of the series who, like his deceased grandmother Natsume Reiko, has the ability to see ayakashi (spirits). He inherited the Book of Friends from her, a book of contracts binding ayakashi to servitude when they were defeated by Reiko. Due to Natsume's strong resemblance to his grandmother, he is often mistaken for her and is pursued by ayakashi who hate Reiko but yearn for the Book of Friends. To rid himself of these troubles, Natsume resolved to end the book by returning all the contracted names to their former owners. He is accompanied by the youkai Madara, nicknamed "Nyanko-sensei" (or simply "sensei"), promising him possession of the book once he dies. In return, the creature must serve as his bodyguard until then. Orphaned at an early age, Natsume was passed on from relative to relative. His ability to see and communicate with ayakashi isolated him from both family and friends throughout his childhood. He was labeled as a 'liar' and 'attention seeker' for trying to tell others about the ayakashi, and his attempts to run away from the youkai had them calling him insane. Natsume then became reclusive in order to try to lead a relatively “normal” life with people. Eventually, he was passed on to the Fujiwaras, a middle-aged couple from his father's side of the family. In contrast to the relatives before, they genuinely care for Natsume, and he loves them in return. He does not want to cause them any trouble, so the ayakashi problem remains secret. Natsume's incredibly strong spiritual power allows him to actually hit and hurt youkai. He develops friendships with youkai and exorcists alike, though the interest of many is to use him to their advantage. 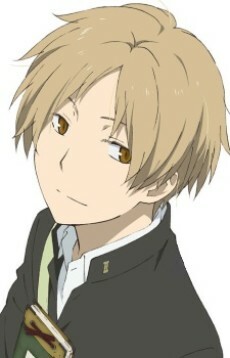 In the anime, Natsume is more cheery and good-natured, while in the manga, he is slightly more dismal and short-tempered, especially toward Nyanko-sensei. To return the names inscribed in the Book of Friends, Natsume must first picture the said ayakashi in his mind to learn of its name. The book then flips open to the page where the name is written, which he takes out and places in his mouth while breathing out. The spell which originally enslaved the spirits used Reiko's saliva and breath; as Reiko's grandson and one who bears a strong resemblance to Reiko, Natsume is able to use the spell as well. The cost of releasing each name, however, is that his energy is almost completely drained in the process.